Two members of staff at an Oxfordshire prison were held hostage earlier this year, according to a report detailing failings at the jail. HMP Bullingdon's Independent Monitoring Board (IMB) said the incident, which happened in an interview room without any alarm bells, was resolved "quickly and safely". The report also raised concerns about rising violence and staff shortages. But it said staff continued to show "professionalism" and "commitment". 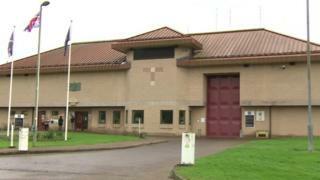 The hostage incident took place in an interview room on the wings of the prison near Bicester where staff can have private conversations with prisoners. The IMB said alarm bells, which are usually found in similar spaces in other prisons, were not in place. It also claimed "chronic" staff shortages were undermining the effective operation of the prison, and said one in five prison officer positions were vacant. Increased levels of violence and disorder were highlighted as well, with the rise put down to gang activity, organised crime activity, and drugs such as Spice. Chair of IMB Bullingdon, Paul Miller, said the board was most concerned about the "significant increase" in violence and the staff shortages. "It's crucial that the issue of recruitment and retention of staff, both nationally and locally, is addressed urgently," he added. Mr Miller also asked for ongoing problems with maintenance at the prison to be reviewed after the report found many signs of "general dilapidation". It said none of the showers had any screens, and many cells had damaged furniture such as missing toilet seats. Mr Miller warned the delays repairing faults and building new facilities "could contribute to rising violence levels". But there was praise for prison staff in the report, which said they were HMP Bullingdon's "greatest asset" and showed commitment to rehabilitating prisoners. A prison service spokesperson said: "Transforming prisons into places of safety and reform is our top priority and we are tackling the challenges we face head-on. "HMP Bullingdon has already begun work to recruit additional staff and improve the resettlement services provided to offenders. "The prison has also taken significant steps to improve adult learning, which will give prisoners the skills they need to turn their lives around."